1. Circoporous sexfuscinus Haeckel, PB: 2869, LM, x 210. 2. Circoporous oxyacanthus Borgert, PB: 3791, LM, x 210. 3. Circoporous sexfuscinus Haeckel, PB: 667, SEM, x 165. 4. Circoporous oxyacanthus Borgert, E: 389, SEM, x 190. 5. 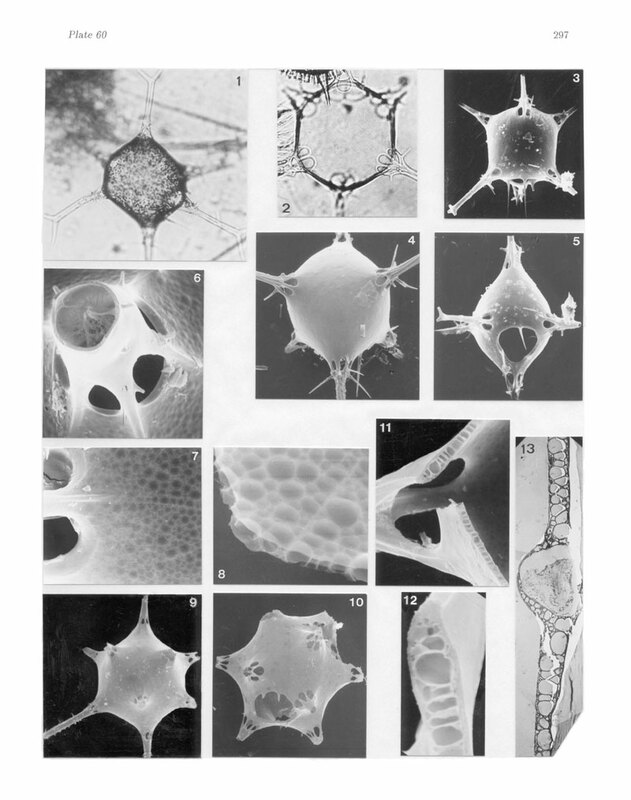 Circoporous sexfuscinus Haeckel, Same specimen as figure 3; view from oral side., PB: 667, SEM, x 180. 6. Circoporous oxyacanthus Borgert, Detail near the base of a hollow spine which has fibers inside., PB: 667, SEM, x 1,500. 7. Circoporous oxyacanthus Borgert, Irregular size and shape of internal structure is seen through thin membrane., PB: 667, SEM, x 1,460. 8. Circoporous oxyacanthus Borgert, Circular to polygonal pores varying in size., PB: 3769, SEM, x 2,100. 9. Circogonia sp., E: 3755, SEM, x 90. 10. Circogonia sp., E: 389, SEM, x 100. 11. Circoporous oxyacanthus Borgert, Near the base of a spine., PB: 667, SEM, x 1,050. 12. Circoporous oxyacanthus Borgert, Same specimen., PB: 667, SEM, x 3,030. 13. Circoporous oxyacanthus Borgert, A cross section across near the base of a spine; pores are variable in shape and size., PB: 3769, TEM, x 2,700.